Super nice handcuff holder for such a low price. 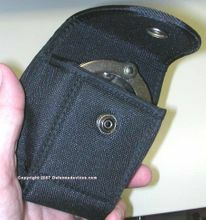 This is a molded nylon holster with taped seams and black snap to close the flap. Will comfortably hold any standard size chain or hinged cuffs. 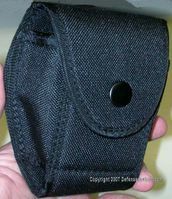 they nylon is molded to allow you easier access to the cuffs. Sewn in belt loop will accomodate wide belts.